With our extensive industry know-how and good market exposure, we are well aware of the latest trends in the industry. This helps us design semi electric stacker that align with advanced technologies in the global market. Today, our widely acclaimed quality assured semi electric stacker finds wide usage across diverse industries, such as, textile, chemical, pharmaceutical, food, etc. We provide this equipment with brake, protection net, handles, protection wheel caps and others. Also, its designed is kept compact, which helps in exceptional maneuverability in tight spaces. 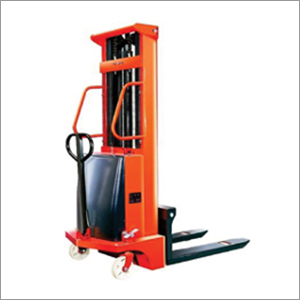 Changeable forged and bended fork is integrated in the stacker along with lifting supporting legs, which are helpful in ensuring steady condition of the equipment during lowering or lifting. It produces very less noise while in use, which is because of its smart screw design. It is comfortable and ergonomic backrest, which reduces the operator fatigue to minimum. We recruit and nurture competent professionals who help us deliver innovative solutions and cost-effective products that are in sync with international quality norms. They work round the clock with relentless passion and strong commitment, ensuring we provide expertise that is second to none to our valued clients.